This large essential oil wooden storage box holds all your essential oils with plenty of additional room to expand your collection. Will fit dōTERRA, Young Living, Scentsy, It Works, Aura Cacia and most popular essential oil brands! When you open your new essential oils storage box you will smell the amazing scents of your Essential Oils. Large Wooden box holds 68 total bottles Holds 56 bottles in an upright position and 12 bottles in a slant position (including roller bottles). Perfect for organizing essential oils. Great for transporting oils to presentations, classes and more. Custom design for a perfect fit of essential oil bottles. Keep all your oils in one location with this Wooden case for essential oils. Logo is located on back of box for a clean look. Sturdy Construction With New Zealand natural pine wood. Stain or paint to your liking or leave as is for a beautiful natural look.place to store my essential oils! I am beyond thrilled at the size and quality of this box holder since it even holds my roller balls. After 3 years of building my collection of essential oils I now have a place to hold all of them and then some. The Aroma Outfitters Essential Oil Storage Box is simply amazing! The beautiful and elegant pine wood is all natural. It is flawlessly crafted to perfection. I love this storage box and I enjoy seeing it on my counter. HOW DO YOU PROTECT YOUR ESSENTIAL OIL INVESTMENTS? As an essential oil user, you've chosen to provide yourself and your family with natural medicine and organic alternatives to store-bought products. As you know, therapeutic grade essential oils are very expensive. Just as you protect your family, you must take action to protect your oils. This durable, 68-bottle storage box is the best possible solution. PRESERVE THE HEALING POWER OF YOUR OILS... Without proper storage, your precious essential oil investments will be at risk of losing their therapeutic properties. Light, heat, exposure to air, and humidity can steal away the efficacy of your oils. With room for 68 total bottles including 58 5-15ml bottles upright and 12 slanted 10ml roller bottles, this storage solution will help rescue your oil investments from otherwise unpreventable damage. ORGANIZATION IS KEY TO USING YOUR OILS WHEN IT COUNTS. Be prepared to put your oils to work at a moment's notice after you get organized using this premium storage box. The 68 bottle capacity will give you instant access to your entire collection, and organization will be even easier with the included set of bottle labeling stickers. 100% SATISFACTION GUARANTEE! 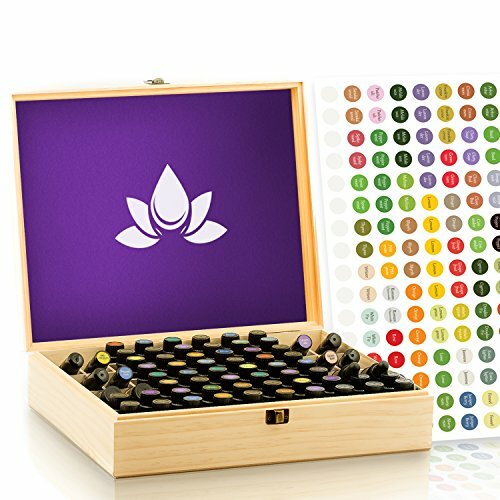 Display this gorgeous box proudly in your home or take it with you on the go, knowing your oils will be safe thanks to its robust design and purple removable foam pad. Aroma Outfitters is a family owned and operated business dedicated to providing you with world class customer service. To prove it, our storage box comes with a Lifetime Warranty against defects in materials or workmanship. Click the "Add to Cart" button now with complete confidence.